The system designed and manufactured by The Mattress Doctor is one of the most advanced systems of its type in the world and is a three stage process. 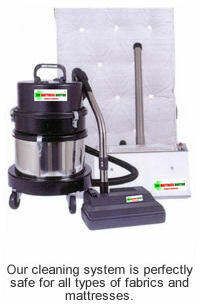 Using The Mattress Doctor HF Power Cleaner, we apply a combination of treatments simultaneously. The Mattress Doctor HF Power Cleaner Head generates high frequency waves which loosens the dust and dirt in the mattress. These are then eliminated with a high power vacuum with a special HEPA filter which traps 99.97 per cent of everything it collects. Using The Mattress Doctor UVC Radiation Sterilising Unit, we sterilise the mattress killing bacteria, viruses and spores. This method of chemical free disinfecting has been proven effective in the medical field. We spray the surface of the mattress with a specially formulated Mattress Hygiene Spray. The spray is harmless to humans and animals and is based on natural ingredients. It is antibacterial, insect repellent and also slows down the reproductive rate of any dust mites that enter the substrate after treatment. Used weekly by the client, this will reduce the frequency that a mattress needs to be cleaned to about twice a year.